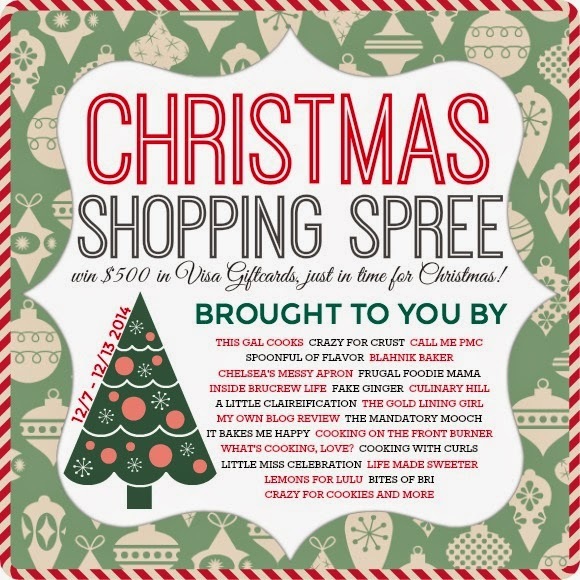 So, what would you do with an extra $500 in your holiday shopping budget this month? That's right, folks. We all pitched in to help make one of your all's Christmas mornings just a little brighter and a tad bit easier on your wallet as well. Use the Rafflecopter below to get entered, friends! Good luck to each of you! The giveaway will begin at 7am est on Sunday, December 7th 2014 and run until 11:59pm est on Saturday night December 13th, 2014. One winner will receive a $500 Visa Gift Card that will be shipped via US Mail. The winner must live within the the United States or US territories. Sorry - many Visa Gift Cards cannot be used outside the US. Visa is in no way affiliated with this giveaway. Pinterest, Twitter and Instagram are in no way affiliated with this giveaway. The winner will be randomly chosen on December 14th 2014 and will be notified by email. If the winner does not respond within 48 hours, another winner will be chosen and contacted via the same method.The winning entry will be verified. If it is determined that the task for the entry was not performed, the entry will be terminated and another winner will be chosen. Social media outlets that are used as entries MUST be valid, active and real accounts. No purchase necessary. Void where prohibited.